My 10-year anniversary at Jacobs Media fast approaches, and these past weeks have been marked by constant and somewhat stressful reflection on that “Professional Bucket-list”… as well as that damn NHL Lock-out. You muse, you mutter, you take stock of experiences, accomplishments, opportunities, and possibilities. You inevitably return to face a list of professional goals yet unrealized. The time comes to talk with family, close friends, total strangers on cross-country flights, the lawn guy, and even valued mentors, including Fred and Paul Jacobs. So here’s the short version. On my 8th anniversary, I made a promise to myself that I shared with Fred and Paul. That 10-year mark now looms like some goal-realization fiscal cliff, and it’s time to keep the self-imposed professional term-limit promise I made to myself 2 years ago. At some point in early 2013, I will be leaving Jacobs Media (probably post-SuperBowl, pre-St. Patrick’s Day). Moreover, the lawn guy is in full support of my decision, provided his money keeps coming from somewhere. Fred, Paul, and I have discussed a transition plan that will work for all involved. My clients were first to get the news, earlier this week. They got over it quickly. We will ensure that each is well-served at every level, every day between now and my departure. In mid-December, while contributing to transition efforts and ongoing projects, I will begin to solidify my lame-duck status as I begin to pursue new ventures. So, let the bidding wars begin. Please. But I’m not dead yet. I’ll be at the Arbitron Client Conference in Maryland next week. Reach me at: ralph@jacobsmedia.com or ralph.cipolla@gmail.com. We’ll have a beer. I may be out of work shortly, so you’re buying. This past decade at the industry’s preeminent strategic consulting firm has been like a 10-year course of study at a World-Class University of Strategic Thought and Skill-Set Development. I “enrolled” March 2003, and I graduate now, enriched with the gifts of expansive experience and broadened perspective. To my many clients and peers: In you, I have been honored to work with professionals who are among the very best at what they do. To the staff of Jacobs Media: I thank each of you for the relationships and experiences I will continue to value long after I depart. I am proud of our collective accomplishments and the innovative work that has solidified our status as the very best this industry can offer. I sincerely thank (blah blah) and it is with mixed emotions that I (lorum ipsum yada yada)… etc etc. P.S. See you tomorrow. I’m going home early. With Thanksgiving in the rear-view mirror and Christmas only 32 days away, we have another dose of bad cheer from Gary Bettman’s #1 elf, NHL Deputy Commissioner Bill Daly. Not without a healthy dose of Black Friday irony, the league announced cancellation of additional regular season games, scratching the schedule through December 14. However, in what may be interpreted by some as a sign of good faith to the player’s union, the January 26-26 NHL All-Star Weekend in Columbus has also been canceled (you were thinking it, I just said it for you). The December 14 date marks the cancellation of 422 games, or 34.3% of the 2012-2013 regular season. However, Mister Daly did say, “We feel badly for NHL fans and particularly those in Columbus.” Hey, I feel better, already. While lamenting a 2-hour layover at Reagan Airport in Washington D.C. – on my way to another national capital, Ottawa, Canada – a plane with 88 World War II Veterans landed at the gate right across from where I sat. This was an “Honor Flight” – 88 heroes of The Greatest Generation had come to town for a ceremony at the World War II Memorial, prior to the annual running of the Marine Marathon. Seeing these men up close and in person, and shaking their hands, was nothing less than unforgettable. Fortunately, we all now carry a combination hi-resolution camera and hi-def video-cam in our pocket. Thanks to my iPhone, for Veteran’s Day 2012, I can share this occasion with you. 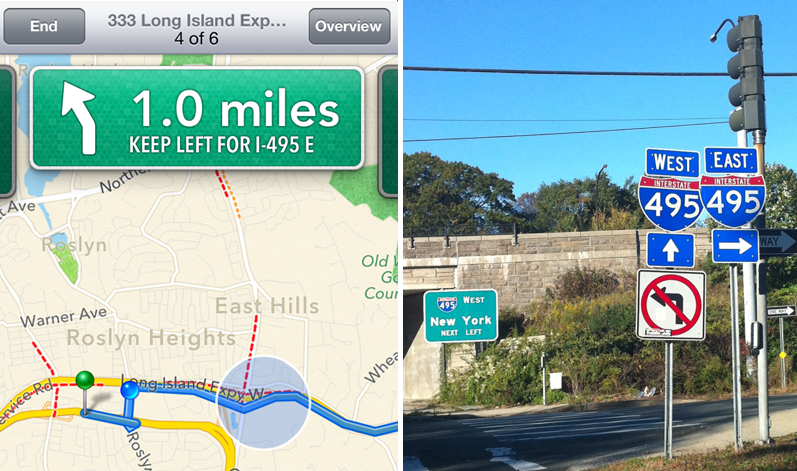 Apple Maps tried to kill me and my mid-size rental car this past week – on not one, but three occasions. Fortunately, this occurred in the passive, patient, forgiving, stress-free rush-hour driving environment of Metro-New York City. See if you can spot the apparent real-time contradiction between: A) The Guidance of Apple Maps (Left) and B) “Reality” (Right). When I created the “NCAA: From Fame to Shame” infographic, I left a lot of relevant material on the table. There simply wasn’t enough room in one graphic of that sort to cover 60 fun-filled years of NCAA misfortune, malfeasance, and mischief. Just how does one acknowledge all those incidents in an organized and chronological manner? Ah, then I brought years of university studies to bear… and all that expense finally paid off (see, Mom?) I’m sure this work will upset some of you… especially alums of those ‘heavy element’ programs – the ones that make multiple appearances in the table. Please, share your thoughts… and if a particular school, program, or scandal is conspicuously absent from the Periodic Table, let me know. This, I fear, is a work in progress. Like the Periodic Table of Natural Elements, it’s always growing – new, ‘heavier’ elements / scandals are always being discovered. I have long considered creating a breed of topical and timely “Infographic” that goes beyond the typical format you see all over the web – the infographic populated by elementary school-level shapes, washed-out primary colors, with humans represented by the asexual icons you see on the door of every public restroom. My first effort – Stairway to 40 – was done to commemorate the 40th anniversary of the Stairway to Heaven release. It landed on the websites of several Rock radio stations, was picked up by @GuyKawasaki (thanks to the awesome @AnnieColbert), and re-Tweeted/linked-to by over 50 kind folks of exceptional taste in the graphic arts (you can see it on the ‘music’ page on this site). Deny, deny, deny – in the face of rumor, on-line murmur, a growing Everest of evidence, and the inevitable Sports Illustrated Special-Collectable-School-Sanction-Securing-Double-Issue Expose´. Let me know what you think… unless you’re a Penn State, Ohio State, Baylor, Indiana U, or Colorado alum. I already know what you think.